This is an update of an old Bedtime Bible Quotes post. It’s a post I need to revisit occasionally when I’m struggling with sleep or someone I know is. 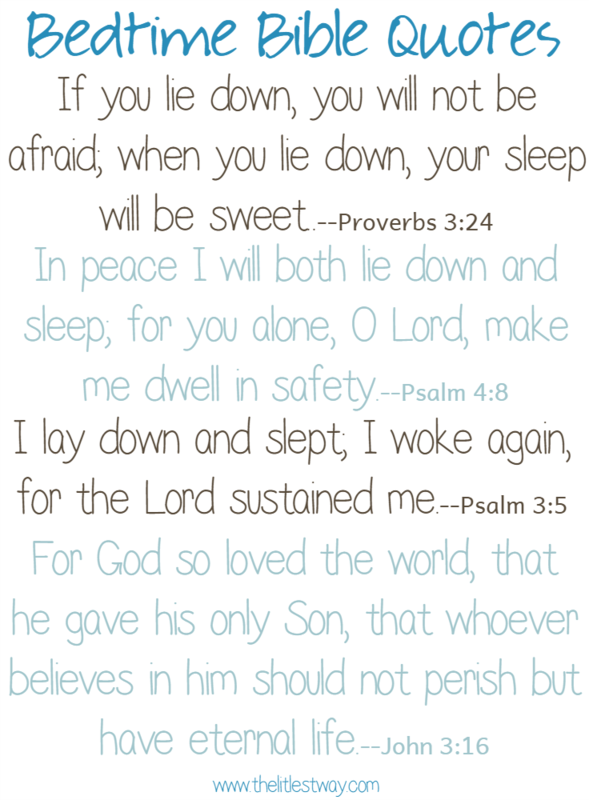 These Bible quotes about sleep are still as relevant now as when this was first written. Chris–who never travels for work and is rarely away from home just returned from being gone for sixteen weeks for work. Sixteen weeks with a fly in late Friday night and fly out early Sunday afternoon every third week. Sixteen weeks of me not sleeping because I don’t sleep well when he’s out of town–which is rare, thanks be to God. During these sixteen weeks, I have relied on a couple of inspiring Bible quotes each night as I have crawled into bed–way too late. 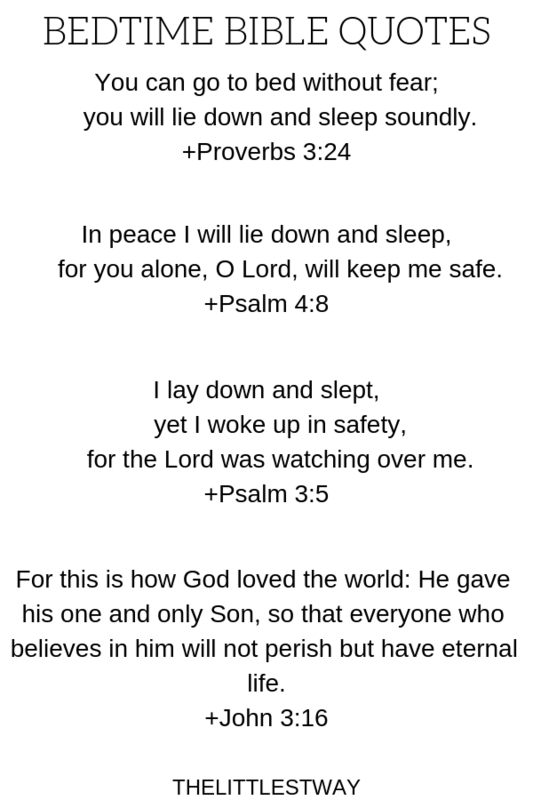 I know I’m not the only one that needs some bedtime Bible quotes, so here is a couple I fell asleep or at least laid in bed repeating to myself. First though let me say, I have a new appreciation for military families–Thank you! And single parents–God bless you. Remember when the kids and I were so very sick with what we now believe to have been that Enterovirus, Chris was gone for those nine weeks. He was also gone for the four-foot long snake crawling up and around the door frame of the outside of the house. And the baby snake, possibly a copperhead, that was on the woodpile, and clogged toilets and broken shower heads and five children needing to be at five different soccer practices and…and… And I wear a bracelet that states, “I can do all things through Christ who strengthens me.” And I could. I made it–we made it all these weeks…BIG shout out to all my children but especially my three older girls. You girls are amazing and I am so proud to be your momma. So back to me and my fear and anxiety about being able to sleep or not being able to sleep when Chris is not here. 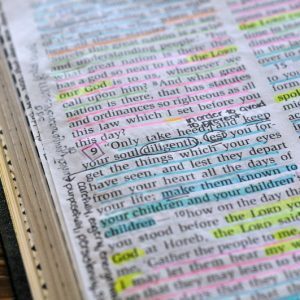 First, I’ve mentioned how important it is to be careful about what we take into our minds (What Does the Bible Have to Say About Our Thoughts). Once it’s in there, it’s in there. And it will resurface at the most inopportune times–like late night. All those scary movies, crime shows, and stories I read or watched as a kid and young adult pop into my head at night, trying to force themselves to be thought about. It takes concerted effort to think on the good, true and beautiful. Once I begin the process of forcing these scary and negative thoughts out of my mind, I have to–have to–replace them with what I want to think about. One way to do this is to meditate on the Word of God. Hebrews 4:12 states “the Word of God is living and active”…those are the thoughts I want to and need to think of, especially at night. I actually started sleeping with a small Bible under my pillow to remind me of the life-giving power of the Word of God. Before I went to bed though, I would try to fill my mind with inspiring bible quotes that would help me settle down and fall asleep in peace. I’ll be honest, sometimes they worked…sometimes they didn’t. But repeating and meditating on the Word of God is always worth it. Repeating and praying these verses at least, at the very least, kept me from allowing my mind to be cluttered with scary lies. These verses would be great verses to teach our children, especially if we have some that have some extra trouble at night. I wish I had these verses to think on as a child. I remember struggling with fear and anxiety at night even as a child. 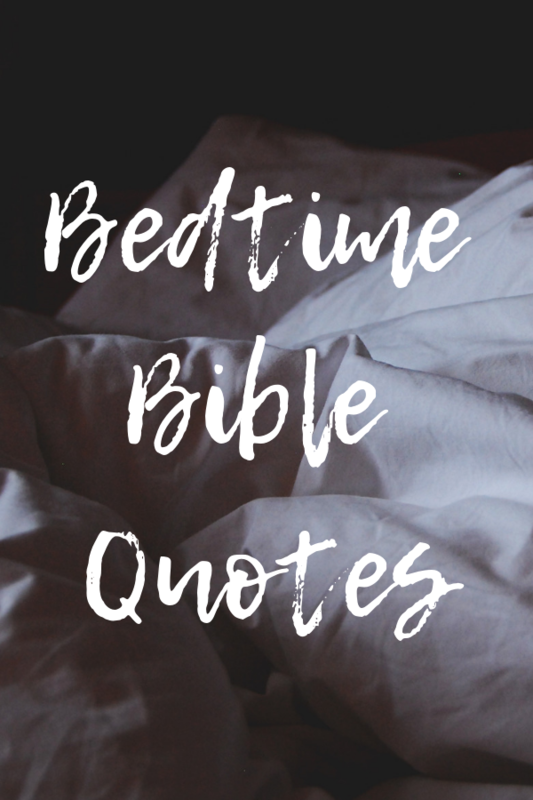 Instead of being told to just go to bed and not think about scary things, these inspiring bible quotes would have helped fill that vacuum. 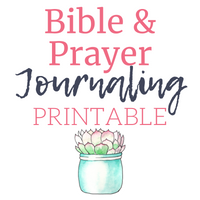 If you have a little one, big one or yourself that struggles at night, print this page of inspiring Bible quotes and prayer them over yourself or your children each night at bedtime. Thanks for this. I am not at all good at staying alone. Like you, I have too much imagination! I like the quotes idea…I too, love my various Bibles. Isn’t that funny. In my mind you are this world traveler and I don’t know, I guess to me that equates unafraid. Hi Amanda. 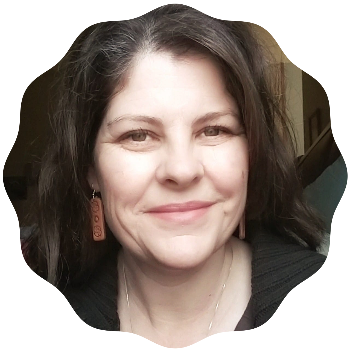 I haven’t worked out the spiritual math yet…Chris gone + house full of sick – whining + friends bringing us food…Hopefully I came out a little further ahead! Oh my goodness, Jenny. I had no idea your husband was gone for SO long! My husband does not have to travel much for his job, but when he does, it is hard for all of us! I think it’s because we’re so accustomed to him being here. I get the same way … I stay up way too late, so that I can’t keep my eyes open anymore. But then I’m so tired in the morning. I appreciate your focus on God’s Word. You inspire me to open my Bible more. I have taken studies, but sometimes I don’t really know what to do beyond that to get to know HIM and His story and the truths that He wants to share with us within that book. Do you have a particular version that you like? I love this printable, too. Perfect for the whole family! I have a couple of different versions. I use my RSV Large print because everyone told me after 40 your eyes change…and they were right. 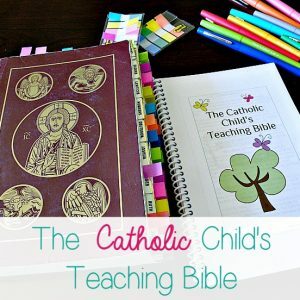 Some days though I just to keep it simple, like the Good News Bible every Catholic school in the world uses! I also have a small NLT translation I like. And then the Grandfather of them all the Douay Rheims. It’s more poetic and I’m not, so I stick with the RSV as my day to day. I love these! My kids sometimes do have trouble sleeping, so I am most definitely printing. Thanks! You are very welcome Gina. I hate how everything floods my mind when I am trying to fall asleep, bills that need paid, chores that need done etc. I kind of do the same thing as you, I often meditate on The Lord. I haven’t tried reciting verses, but like you said it’s always worth it! Thanks! !